We're approaching the Sunday, July 20, 1969 anniversary of Apollo 11's landing on the moon, so I figured this article would be a timely reminder of the contributions made to electronics technology as part of the immense effort. The thumbnail to the left is the front page of my hometown newspaper on July 21, 1969 (my father was the classified ad department manager there - see inset). Apollo 16 launched on April 16 of 1972 and landed on the moon on April 19. 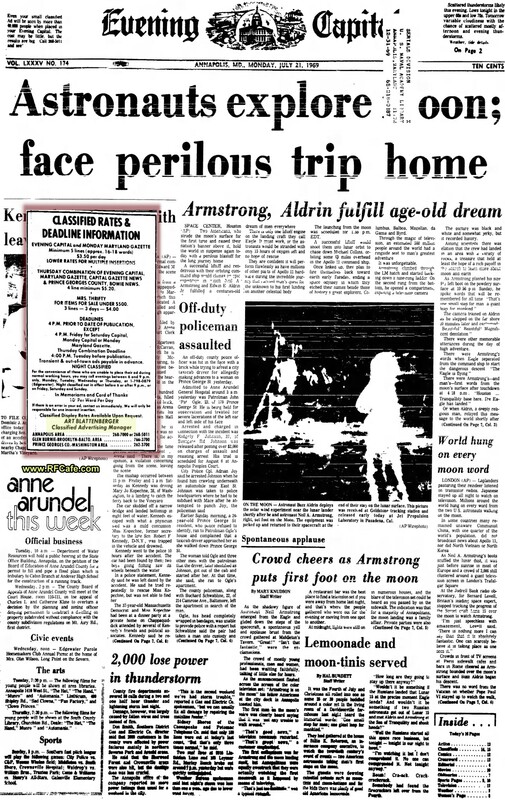 By then, as with Space Shuttle flights, moon landings were no longer front page news; The Evening Capital carried the story on page 2. Popular Electronics magazine editor Snitzer wrote this short piece extolling the critical role that electronics played in mission success. Apollo 17 flew next and December 10, 1972, marked the last time mankind ever set foot on the moon. President Trump has asked NASA to explore the possibilities of returning to the moon by 2019, possibly as a next step toward a mission to Mars. By the time this appears in print, any excitement that may have been generated by the successful flight of Apollo 16 to the moon and back will have been dissipated. Even while the flight was going on, all it meant to most people was reading a couple of newspaper headlines or watching briefly the TV coverage. But how blasé can we get? Maybe it's just the enormity of the achievement or because men have walked on the moon before. Or, maybe it's because there were more important things to be concerned about at the time. Whatever the reason, most people simply accepted the moon flight as a matter of course. 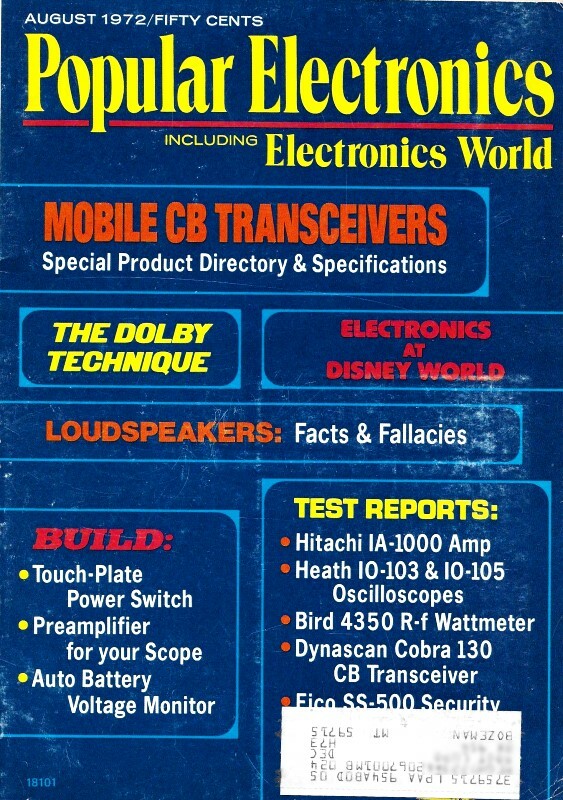 However those of us who are interested in electronics, either professionally or as hobbyists, should pause for a minute or two. Would it all have been possible without electronics? There would have been no Saturn countdown computers monitoring more than 3000 parameters during the countdown leading to the takeoff. There would have been no inertial guidance system to keep Saturn on course. We would not have been able to track the flight from beginning to end using ground and shipboard radars. We would not have been able to monitor the astronauts on the moon without the color-TV camera assembly which was controlled on the earth. There would have been no lunar communications relay unit to transmit voice, telemetry and color TV from the surface of the moon and receive transmissions from the earth. What about the lunar module communications system which transmitted and received voice, telemetry, biomedical data, commands, ranging signals and television to and from the earth on a microwave carrier a little above 2000 MHz, and to and from the command module orbiting overhead on a little under 300 MHz? There would have been no vhf ranging system to tell the distance between the lunar module and the command module. And no backpack radios for the astronauts to use while exploring the moon's surface. And no rendezvous radar/transponder, and no lunar module landing radar. And on and on the list goes. We are not saying that the electronics was the most important thing on the flight, but we are saying that without it, the flight as we knew it would have been impossible.